Ideal for large groups, 5 bathrooms, wi-fi access. Discounts for smaller groups. Lovely village cottage, tucked away in this friendly Limousin village and just a short walk to several village shops, bars / restaurants and a swimming lake with sandy beach. The beach is ideal for guests with children, providing fabulous, free entertainment. Saint Germain les Belles is really easy to get to - you can take a flight to Limoges (look up Ryanair and Flybe) and we are then just a 40 minute drive. We are situated 10 minutes from junction 42 of the A20 motorway, the main route from Paris to the south of France. The Limousin has been called the 'French Lake District' and the tranquil countryside surrounding the village has many lakes, with walking / rambling and cycle tracks through forests and historical villages. Wherever you are in Limousin, you will not be far from a lake. You can swim in most of them in summer and they often have sandy beaches. The Spectacular Lake Vassivière – one of the largest lakes in France, is just 40 minutes away. The “Isle de Vassivière” is the home of the National Centre of Contemporary Art. Follow signs for ‘L’Isle de Vassivière’ and walk across the bridge to the main island of the lake. Apart from the Art Centre, there are some lovely walks in the woodland and great places for a picnic. If you are interested in doing a spot of fishing during your holiday, then the region is full of under-fished lakes and rivers. To see the beautiful, unspoiled Limousin countryside from a different perspective, there are various canoeing centres, from which you can hire canoes and kayaks for a day’s adventure. Limoges – the ‘capital’ of Limousin is 30 minutes to the north and is famous for its porcelain and there are many outlet shops, or smaller boutiques where you can buy pieces to suit all tastes and pockets. You can also enjoy antique markets, the covered food market, medieval churches and our personal favourite – the ancient carousel at Place de la République. Five of the bedrooms have private en suite shower / bathrooms. Each is equipped with a WC, sink and bath or shower. We frequently receive comments from our large groups about how grateful they were that they didn't have to queue for the shower! The ground floor disabled access bathroom has been created with wheelchair access in mind - please contact to discuss suitability. The large kitchen is very well-equipped. You will find a dishwasher, microwave, fridge/freezer, big gas oven, kettle and toaster. For kids and grown ups! Whilst renovating the house, we realised that it was very important that guests who use wheelchairs should be able to access as much of the ground floor as possible. If you would like further information on the suitability of the house or the accessibility of local places to visit, please do get in touch. The attractive, paved terrace has a huge dining table, perfect for alfresco dining. We also commissioned an enormous barbecue to cater for our large groups. This provides a perfect spot for parents to relax, whilst keeping an eye on the children playing on the lawn. The garden area gets the morning sunshine, so there is a smaller table and benches to which you can take your breakfast! Additionally, the large, safe lawn area is perfect for families with children. We provide many ‘bulky’ items to make holidaying with young children easier e.g. baby cots, high chairs, cutlery, baby swing, toys, changing mat and table. If there is something missing from the list - please tell us what it is and if we can use it for future groups, we will have it ready for you at no extra cost! What an idyllic place! We had a wonderful 4 night stay at this beautiful property and made full use of the spacious garden. We enjoyed our evening meals sat at the table outside with gorgeous views of the sun setting over the fields beyond. The Gite was full of character and charm and was very well equipped, we didn't want for anything. The local bar/tabac, bakers and butchers are all a stones throw away and the campsite offers delicious food with very welcoming staff (even if they were a little bemused at having a hen party arrive for dinner!). And a lot of fun was had by all at the swimming lake which is just a 10 minute walk. In the lead up to our trip the owner was extremely helpful and happy to answer any queries we had about the property and local amenities. We came to France from Australia for the wedding of our daughter. We wanted somewhere for all our family members who were travelling. This was the perfect house for us and was better than I anticipated. It was clean and had everything we could possibly need. Having ensuite bathrooms in most of the bedrooms was great, no one felt they were getting in anyone's way. The house was warm, and even though the weather was chilly it was warm inside. The boulangère and pâtisserie were just across the road and a small supermarket just around the corner. There was plenty of exploring of caves and interesting places to visit. It was a great house! The owner was very accommodating to our needs. A last minute booking that the owner responded to fantastically. The property was perfect for our family. Had a lovely stay at this wonderful gite, there were 15 of us and there was plenty of room for us all. Out of the 6 bedrooms there are five en suites so there was no queuing for the bathroom! The gite is very clean, has a beautiful garden and patio area at the back. The village has a bar / tabac, boulangerie, patisserie, general grocers and a butchers all within a few minutes walk. I would definitely recommend this as a place to stay for a family break and I will certainly be returning in the future. My family and I spent a wonderful week at Vacances Vertes Les Belles at the end of June. The house was as advertised and more.It was clean , comfortable and accessible.We loved being in the village close to the butcher, baker green grocer and cafe, yet stepping out the back door and literally being in the country. We made good use of the veranda and the meadow beyond it. Fresh strawberries in the morning were delightful as were the fabulous fresh vegetables which our host Anna supplied to us. Because the clothes washer was not working, Anna on two occasions picked up our dirty laundry and returned it ti us on the same day washed,dried and folded.Our five year old grandson loved the beach and lake at the edge of town and the adults enjoyed touring several of the lovely villages in the region. In short , this was a fabulous place for a family vacation. Thanks so much Gene, it means a lot to us that you enjoyed your holiday. We loved meeting you and your family and hope to have you stay here sometime again. Best regards, Anna. 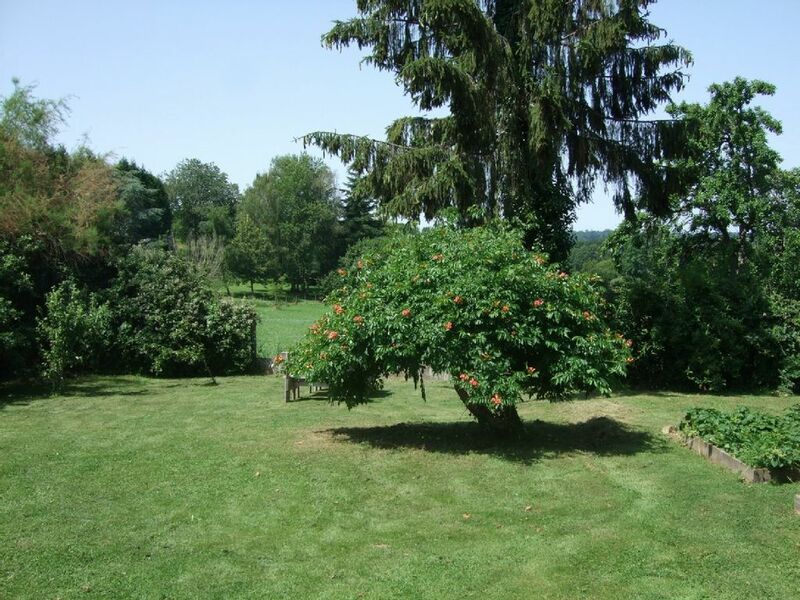 We have stayed in this gite on several occasions and we have always enjoyed the experience. The house has been refurbished and modernised to a very high standard and it has a great 'feel' to it. The bedrooms are quiet and the bathrooms are modern. Downstairs there is a very large kitchen with an enormous table and if you want to eat in, the cooking facilities are fine. Outside there is a large barbecue. If you would rather not cook - then 'Le petit moulin' or 'Chez Kurko' are two restaurants in the village where you can get a good meal at reasonable prices. There is also a bistro in a nearby village which will deliver a complete meal to the gite. The lounge is comfortable and there is a satellite television. The whole area is very beautiful with lots of forests and lakes and it is all very peaceful. We thoroughly recommend this gite to anyone who is thinking of spending some time in this beautiful area of France. You can find everything you need, right on your doorstep. The village has several small, local shops (selling tasty local produce), a network of country walks, a rail service to Limoges and a swimming lake, complete with sandy beach! Bike hire is also available. This village cottage is ideally situated to explore Limousin, which is often called ‘the French Lake District'. We can guarantee that it will offer you some of the most unspoiled natural landscapes in France. There are many other lakes (also providing loads of fishing, sailing and canoeing opportunities!) beaches and outdoor swimming pools in our area. Beautiful Lake Vassiviere, Europe's largest man-made lake, is only 45 minutes away and is also the site of the national contemporary art gallery. Thirty minutes to the north, is the attractive city of Limoges - famous for its porcelain and old quarter. Other historic towns and villages in our area well worth a visit, include Segur le Château, Pompadour, Uzerche, Tulle. ** DISCOUNTS ON ADVERTISED PRICES FOR SMALLER GROUPS ** - All charges are included - Bedding, towels, heating, electricity, cleaning and wifi. - Baby equipment - we have 3 travel cots and mattresses, toys, 2 high chairs and toys - We ask for a 25% deposit to secure the booking.